The movies love to remind us that brilliant minds are often the most tortured. 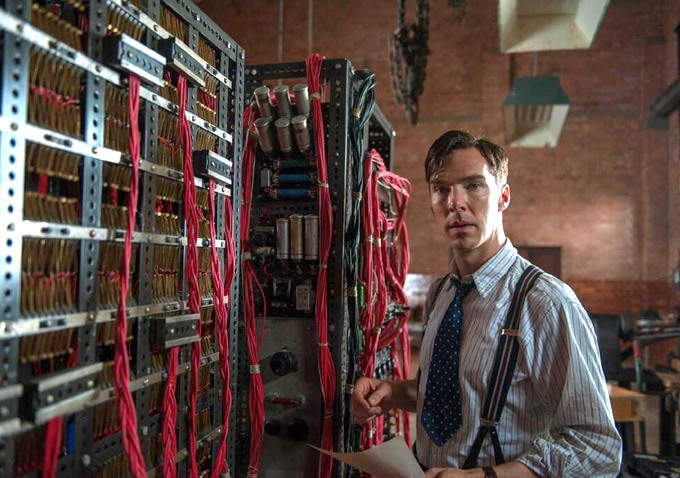 Far be it from Morten Tyldum to suggest any differently in “The Imitation Game,” a World War II procedural detailing the efforts of cryptanalyst Alan Turing and his mathematically-inclined underlings to decrypt the Nazis’ famed Enigma machine and turn the tides in England’s favor. There’s more than one way to become a wartime casualty, however, and their secret office is its own sort of front line. As played by Benedict Cumberbatch, Turing is a genius in the “The Social Network” and “A Beautiful Mind” mold: brilliant but utterly lacking interpersonal skills, with an added dash of Drax the Destroyer’s literal-minded humorlessness. Perpetually stone-faced, he’s frequently lost in thought at the expense of those trying to reach him on even the most basic level; it’s to the movie’s credit that there’s no hokey attempt at visualizing his brilliance via superimposed swirls and flashes of light, as is often done in films of this sort. Even in his most intimate, wrenching scenes, Turing is at a remove from both the audience and the people working alongside him. Rather than frustrate, this distance serves to underscore his status as a double outsider — in addition to possibly having Asperger syndrome, Turing was a homosexual, something the film reveals in an off-the-cuff manner befitting the man’s personality. It deeply affects him, but not in a way he’s willing to show the world. Through flashbacks that also show his first love, the film links Turing’s preternatural cryptographic abilities to his inability to fully grasp the nuances of verbal communication. (“How is that different from talking?” a young Turing asks after his closest friend explains the coded nature of messages that say one thing but mean another.) As these pieces fall into place, Turing becomes ever more sympathetic while still feeling beyond anyone’s grasp to help or even understand. Still, the misunderstood genius constantly proving naysayers and half-wits wrong is a trope that probably peaked with “The Social Network.” When we hear a superior officer blatantly set Turing up with a chance to display his intellectual dominance for a cheap laugh, it feels like needlessly stacking the deck. Cumberbatch handles this and other tired conventions with aplomb, sliding effortlessly into a role that practically demands to be overacted. It’s a reserved, almost conservative performance, and in holding so much back so much of the time, Cumberbatch makes his few outward displays of emotion far more impactful. As Turing’s colleague/eventual wife Joan Clarke, Keira Knightley does exceptional work in a role that could have easily been expanded — much of her screen time is spent humanizing Turing by showing his capacity for non-romantic love and affection despite her IQ coming closer to his than anyone else’s. Her brilliance isn’t her defining characteristic, as Turing’s is, but Knightley joins her co-star in maximizing a familiar, even underwritten role. The aftereffects of eventually cracking the Nazis’ code is described by Turing as “blood-soaked calculus”: a utilitarian decision-making process that weighs the number of potential Allied lives saved against the possibility of Germany realizing their Enigma machine has been decrypted and immediately reprogramming it, thus undoing years of painstaking work. One scene in which a member of Turing’s team is personally affected by one of these actuarial choices notwithstanding, Tyldum doesn’t show the depths of this moral reckoning as much as he could have. A few math experts sit in a room debating whether or not saving a ship full of civilians is worth it if it means losing the war. Call it the banality of good. A version of this review ran during the Telluride Film Festival. “The Imitation Game” opens in limited release this Friday.